The intake is a 20' (6 m) length of 18" (45 cm) diameter pipe with hundreds of 0.5" (12 mm) holes drilled in it. It was put in a trench parallel to the stream and covered with rock. This way we did not need to excavate or pour concrete in the stream bed. When we were ready for water, a few shovel strokes (human powered) let water run over the intake and back into the natural stream bed again. 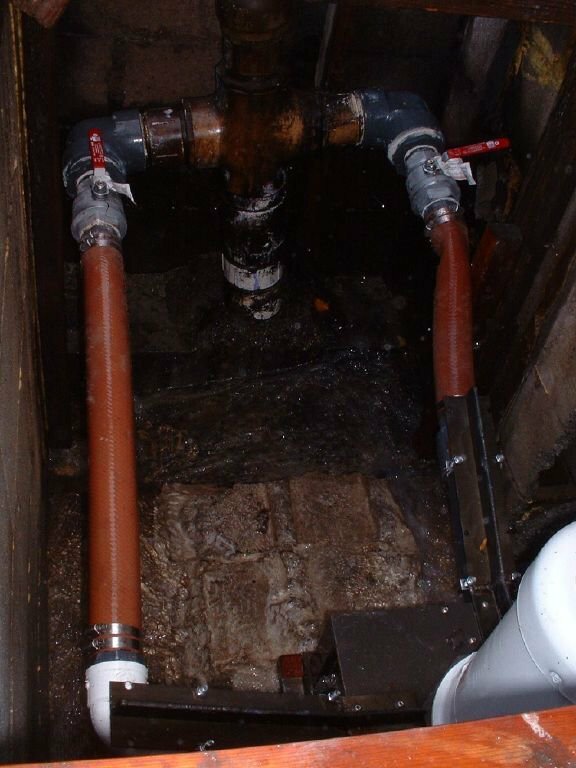 We then continue with a few lengths of 8" (20 cm) pipe and an air vent riser before going to 6" (15 cm) for the rest of the run. The pipe has "floated" up out of the ground a bit over the years because holes were not drilled in lower half of the pipe perimeter. This picture was taken in late November after two of the driest years ever. Once I put a smaller nozzle in at the turbine, the water filled up the lower part of the picture and ran to the right back into the stream. The pipe was buried in a trench about 4 feet deep most places. Near the top of the highlighted route it was much deeper to maintain grade. 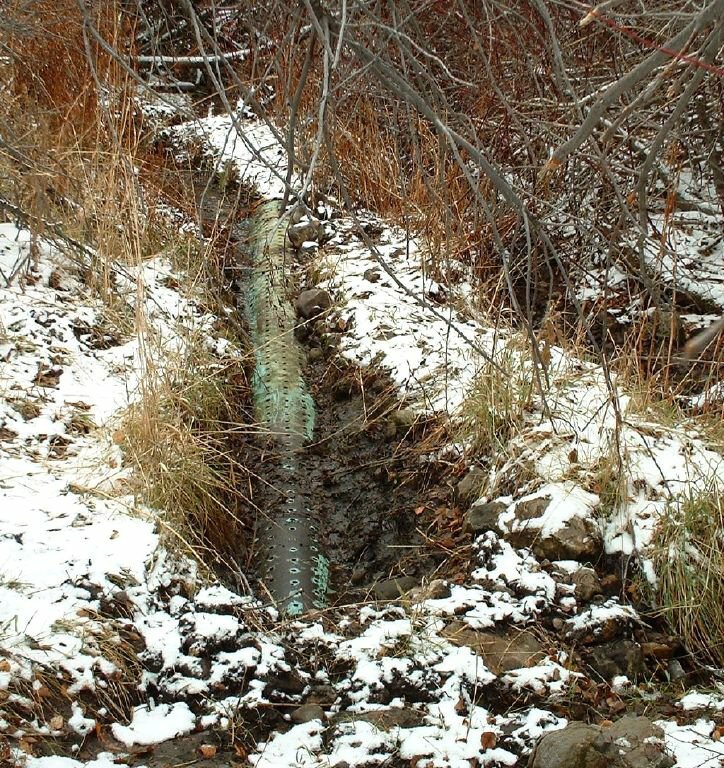 The pipe and installation cost are the largest part of the total cost of a microhydro system. 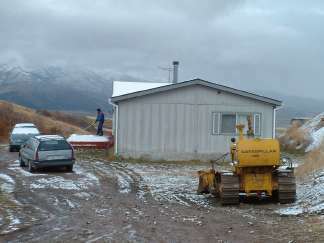 We hired someone with a backhoe to dig the trench, but the pipe was installed by family and back filled using our dozer. 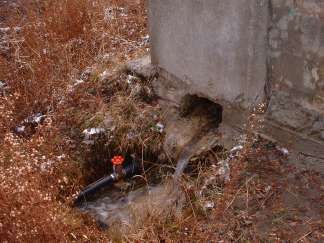 The lower section of pipe shown in the second picture crosses the stream underneath an existing culvert. 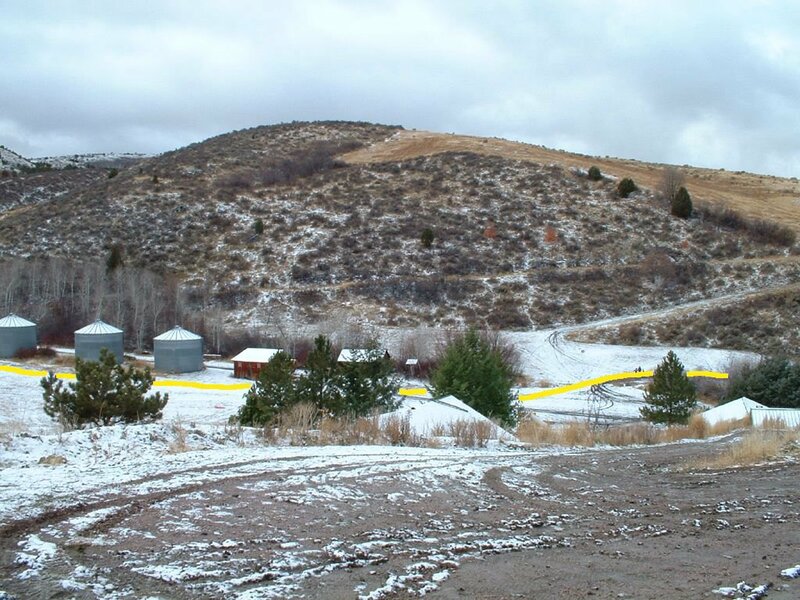 The intake is about 60 yards (meters) beyond where you can see in the upper section. The turbine is just over a 100 yards downstream of the edge of the picture below. 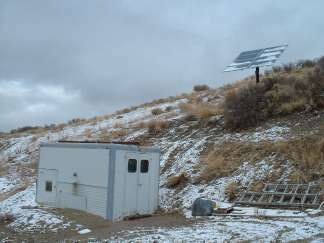 A small shelter for the turbine and piping was build from concrete block. 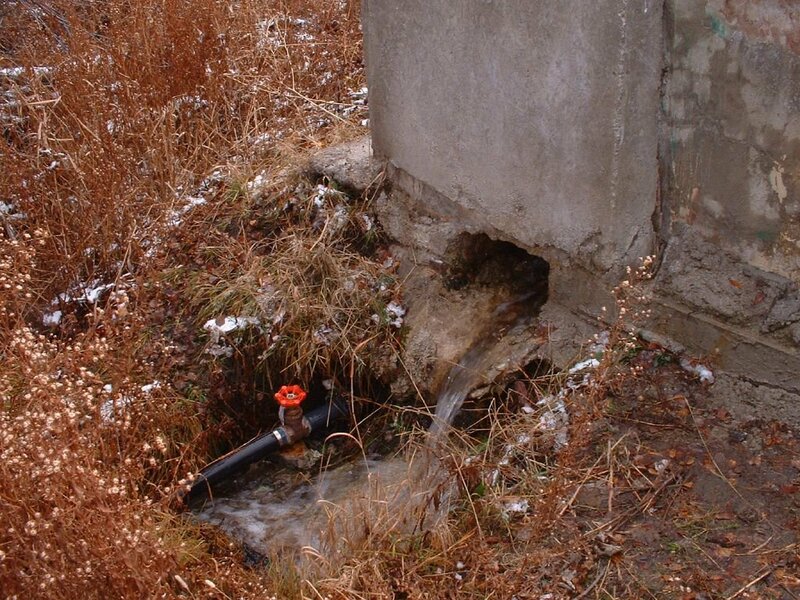 The wet end (with the horizontal shaft turbine configuration used the first 3 years) of the block started to crumble from freeze thaw damage so a concrete jacket was poured around part of the structure to stabilize it. The capacitor bank and circuit breakers to the capacitor bank are seen on the near side. Only 3 of the capacitors are used. I have a collection of various sizes which were used to find the optimum configuration. I found better results when I used lower values of uF in an attempt to hit a target frequency which matched the turgo peak power rpm, than trying to add more uF in an attempt to get the voltage up where I thought it should be. 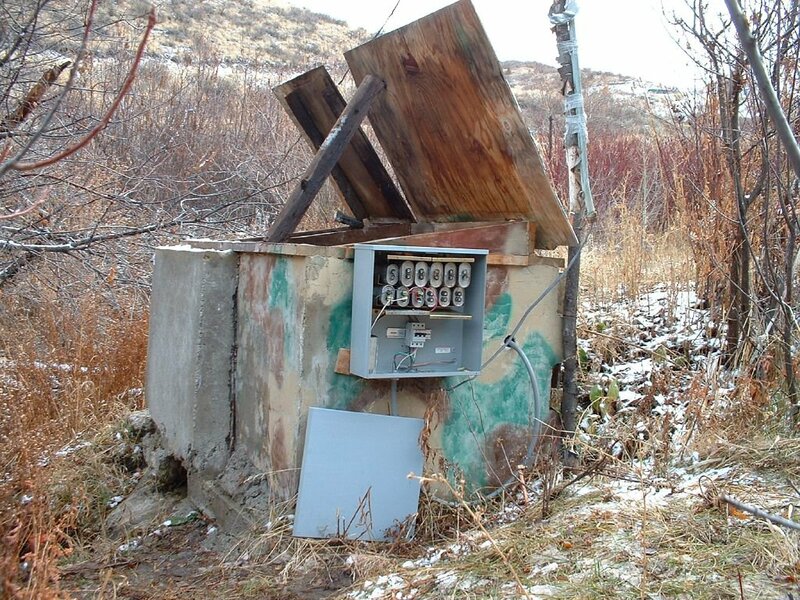 The transmission line wire is suspended as it crosses the stream, then is buried the 800' or so to the battery bank located in the "radar shack". The outflow (tailrace) and drain valve are shown in the picture below. The foundation and floor of the blockhouse was poured with 2 cubic yards (2 m^3) of concrete as a thrust block for the end of the pipeline. The motor-generator used in the original horizontal shaft system with an ES&D pelton was mounted on a concrete block pedestal in the blockhouse. 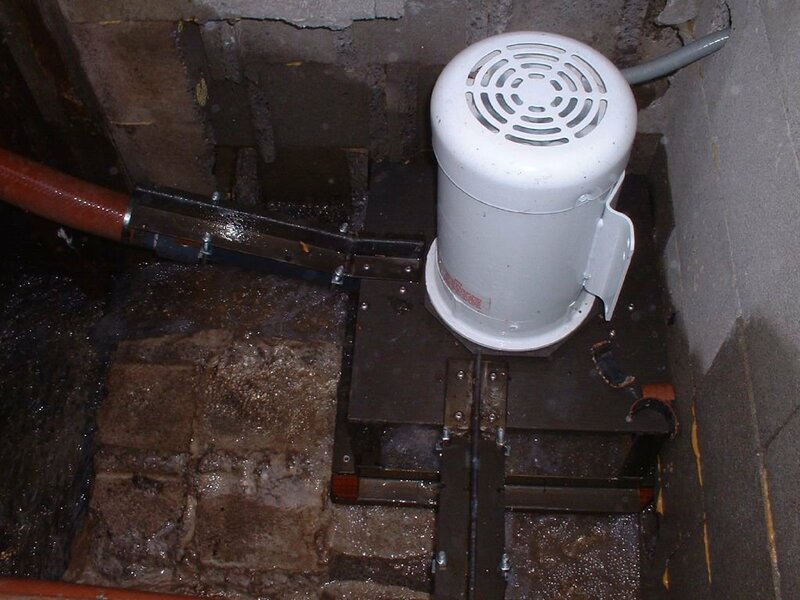 When I put in the new vertical shaft turgo I was unable to chip out all of the mortar under the pedestal. If the blockhouse had been built a couple of feet larger, especially in the width, it would be much easier to work inside. Now it is a very tight squeeze to get in and change a nozzle. 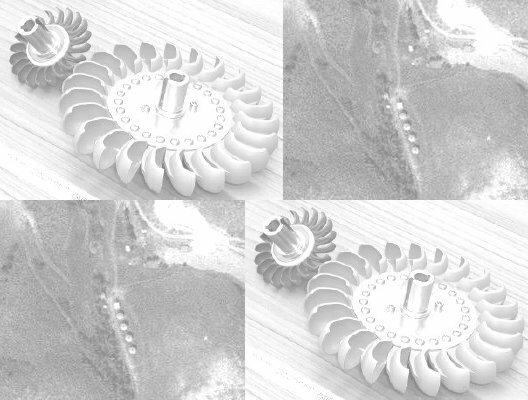 A larger space would have allowed the nozzles to be 180 degrees apart on the runner instead of 90 degrees, reducing bearing loads by symmetric loading. 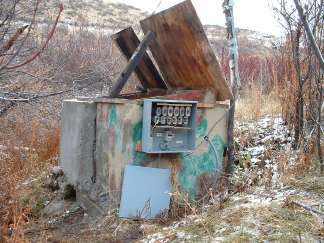 A surplus military truck body purchased about 30 years ago houses a LPG fueled generator, battery bank, inverter, hydro battery charging equipment and miscellaneous farm junk. 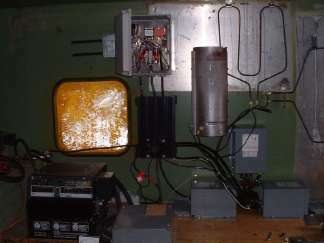 The small side door on the lower left of the radar shack provides the access to the battery bank compartment. An 800 W solar array on the hill above was added this summer to help out when water is low. The combination of PV and hydro is nice, though the PV cost more than the hydro, and puts out much less power on a 24 hour basis (assuming good water flow is available). Inside the radar shack (below) you can see the Trace inverter, and mounted on the wall my hydro dump loads, 3 1kVA transformers, and a heat sink with a 3 phase 100A bridge rectifier. Installation of this system was motivated by the need to provide power when this house was build a few years ago. The power company charges about $5/foot to bring in power, and it is over 5 miles to the nearest power lines. 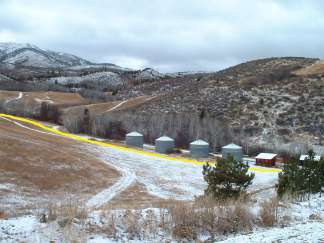 This project cost less than a tenth of what it would cost to bring in power lines, and there is no monthly power bill. For me it has been a fun challenge, that my wife might say has become an obsession. A more detailed write up (without pictures) was posted to the microhydro egroup site a few years ago. It is copied here , though some of the links in this page may not resolve correctly from this site. The distracting background watermark is a composite of an aerial photo of the farm found online, and pictures of a pair of my turgo runners.